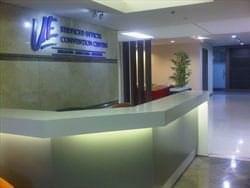 Find My Workspace lists over 95% of the serviced offices market in Central Jakarta. Simply click Request Quote to check pricing for one office, or Add to Basket for multiple offices. This building features the latest design and technology while providing amazing views of Jakarta and ample natural light via full-height glazing. The office building is directly linked to the 5-star Hotel Indonesia Kempinski, serviced apartment tower, retail plaza and entertainment complex. A Fitness First Platinum facility incorporates outdoor swimming facilities. This is a world class Japanese engineered building, is strategically located within a commercial complex of Senayan Square. The centre is surrounded by excellent facilities for both business meetings and leisure such as Plaza Senayan and Senayan City shopping centre, Mulia Hotel, Fairmont Hotel, Senayan National Golf Club, and upscale apartments as well as entertainment and dining venues. The complex is adjacent to the southern part of Jakarta where most expatriates’ residential area is located. This centre prides itself with a few achievements – its location in Jakarta’s principal business boulevard (a part of the Sahid City Complex), and is also recognised for its high client-value, and client-retention rates. A lively, and a committed team work to make the clients feel welcomed, and the occasional tea-parties allow for clients’ mingling, and networking. This is more than the conventional office workspace. 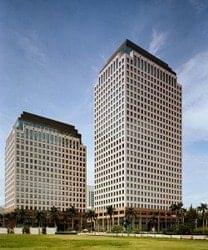 Strategically located in the Golden Triangle of Indonesia’s largest financial district, this modern business centre is in the heart of the city’s commercial and business activities. All 54 serviced offices are tastefully furnished and equipped with the latest integrated telecommunication system and office equipment, allowing businesses to become operational immediately. 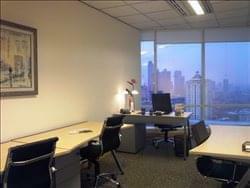 This business center prides itself with a few achievements – its close proximity to the Indonesia Stock Exchange, close proximity to the main business community, its high client-value, and client-retention rates. A lively, and a committed team work to make the clients feel welcomed, and the occasional tea-parties allow for clients’ mingling, and networking. This is more than the conventional office workspace. This center is located on levels 46-50. Our products include: fully furnished office suites, meeting room facilities, video conferencing facilities, value-added business support services, and fully managed Virtual Office solutions. Our comprehensive facilities and amenities include : 54 Ready-to-use suites, dedicated on-site receptionists on each level, 6 fully equipped meeting rooms, 1 fully equipped conference room with a 55” television, high-speed broadband internet access, shower and changing room facilities, fully stocked pantry with beverage service, business lounge, fitness room, individual unit air-conditioning, 24 hour access, and use of building directory board for company branding. Growth, variation and order are important characteristics of business that the designers have sought to encapsulate in the center’s architecture, and so this logarithmic curve becomes the focal point of the tower’s design. The curvature shapes internal spaces, and provides this unique space with spectacular panoramic views of metropolitan Jakarta. The center’s interior is aided by the exterior facade – a series of layered reflective surfaces aid in mitigating heat gain, ensuring that the office spaces remain cool and comfortable working environments. The center’s impressive shape culminates in a peaked roof that resolves the architecture with the sky — here, a public lounge and restaurant occupy the top floors. This space is fully-equipped with Fiber-Optic Backbone Infrastructure which enables high speed Wi-Fi and broadband internet access. The center boasts amenities including; an exclusive restaurant on the top floor, Mini-Market, Banking facilities and ATM access. The ample parking area is also available for 630 cars in five levels of basements to give convenience in a business and working environment. Each suite is equipped with high speed broadband wireless internet access, personal phone system, centralised air-conditioning unit, with facilities including meeting room, lounge, phone answering and cleaning services. The business center caters to businesses of all sizes and can be customised to meet the specific needs of business entrepreneurs and corporate companies. Opening soon. A contemporary coworking space. An exciting feature of this location is the games room. Challenge your colleagues to one of the many activities. The centre comes kitted out with an event space that includes a sound system, lighting controls and a projector. There is a wellness room for those who are looking to meditate, pray, or you are a nursing mother. Onsite showers are perfect if you run or cycle to work. Refreshing iced fruit water keeps you hydrated during the day. 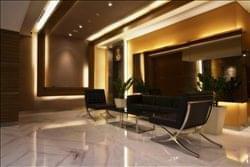 This is a Grade A Building located at the most prestigious area in Jakarta. The centre offers a range of office solutions, along with meeting rooms and a whole range of other amenities. 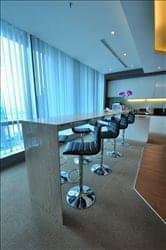 Clients will also be able to enjoy the very beautiful views of Jakarta city. To obtain information for your selected Central Jakarta Serviced Offices, please tick the "Add to basket" box for each office you prefer and complete the form below. We will then send a detailed report via email.